Kate DiCamillo stood in the nave of Riverside Cathedral, her curly hair barely visible over the podium, her voice clear and strong as she delivered the keynote address for the 85th Teacher’s College Reading and Writing Project Reunion (October 19, 2013). The audience of teachers laughed; DiCamillo’s dry delivery in describing her mother’s attachment to a housecleaning appliance was part retrospective for the older teachers and part kitsch for the newer ones. “Remember the Hoover?” DiCamillo quoted her mother as saying, “that Hoover was useless!” But as she recounted how her mother’s illness progressed, the appreciation for this appliance took on new significance. “I really hope you will take the Electrolux,” her mother told her, “that makes me feel better.” So when her mother passed way, DiCamillo did take the Electrolux, but put it in the garage through that winter. She reflected that when her mother was dying, she had held her mother’s hand in comfort, an action profoundly different from all the ways her mother had taken her hand when she was younger. The crowd was visibly moved by this retelling of the loss of her mother, but in typical DiCamillo storytelling fashion, her speech then veered off to include the death of a squirrel. Shifting from the pathos for her mother, DiCamillo recounted that one day, a dying squirrel had chosen the front steps of her home as the last stop on his final journey. His eyes were open, yet unseeing; his chest dramatically heaving with his last breaths. “I didn’t want him to suffer and die on my front steps,” she bemoaned. So, she called a friend. The advice she received from her gentle and humane friend appalled her. “‘Do you have a shovel…and a tee shirt? '” asked Carla. Fortunately, before that plan could be executed, the squirrel had crawled away. “He may have heard us, or he had moved to get away from my presence,” said DiCamillo. The same people who had been tearing up from from the death of her mother and the power of the Rilke poem were now laughing out loud; the cathartic shift in emotions had been seamless. She paused to consider their mutual despair over loss. And in that instant, a cathedral full of teachers understood that great ideas do not happen in (pardon the pun) a vacuum. 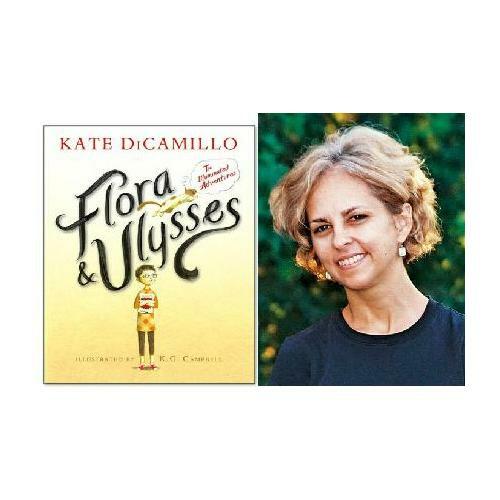 DiCamillo’s speech illustrated how the three seemingly unconnected elements in her keynote address were the elements of story she combined in her latest book Flora and Ulysses. In this story, there is a vacuum, a squirrel, a shovel, and several lines of the Rilke poem. To be more specific, there is the near death experience of the squirrel, mistakenly sucked up by the Ulysses 2000; there is a comic-book superhero aficionado who intervenes; and there are several drafts of meta-physical squirrel poetry. The story has the “beauty and terror” from the Rilke poem as well as the giving of a hand for comfort. There are what DiCamillo terms, “eccentric, endearing characters” presented in a format that combines print with comic book styled illustrations. Like the keynote address, the novel plucks at both the heart and the funny bone; it is a wonderful story. The biography on DiCamillo’s website reads, “I write for both children and adults, and I like to think of myself as a storyteller.” Listening to her speak, I cannot think of her as anything else.